glorious days sober from alcohol. 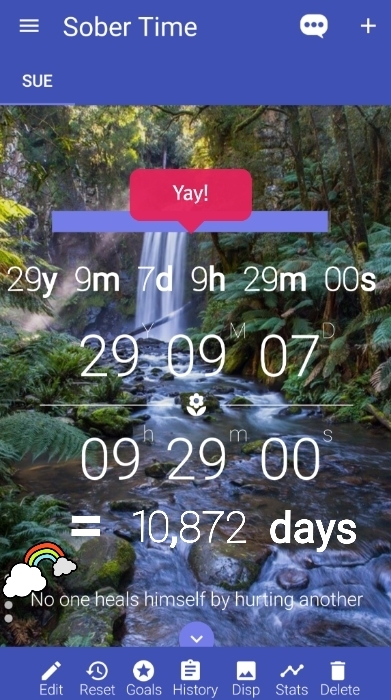 1 year, 1 month, 15 days of grateful sobriety. 51 days today! Last year I got to 90 and relapsed hard. Way more focused this time. we got this you guys!! This is day 5 for me!! Almost 4 years of Sobriety and 4 months ago my inability to communicate my problems started a downward spiral and ended up using again, lying to and betraying the most perfect, loving, caring, trustworthy woman I could ever have had. It’s hard to stand by and watch her go but she deserved better than my actions the last 4 months. It’s officially my 2 year anniversary today!!! Can I ask how you did it? 429 days, or 14 months and 4 days, or 1 year, 2 months and 4 days.